This week saw the launch of The Highway’s new summer menu that can be enjoyed both in on the bistro or on the Highway’s infamous deck. We know that on a hot night The Highway is THE place to be and we got a chance to taste some fabulous dishes from the new light and fresh summer menu. 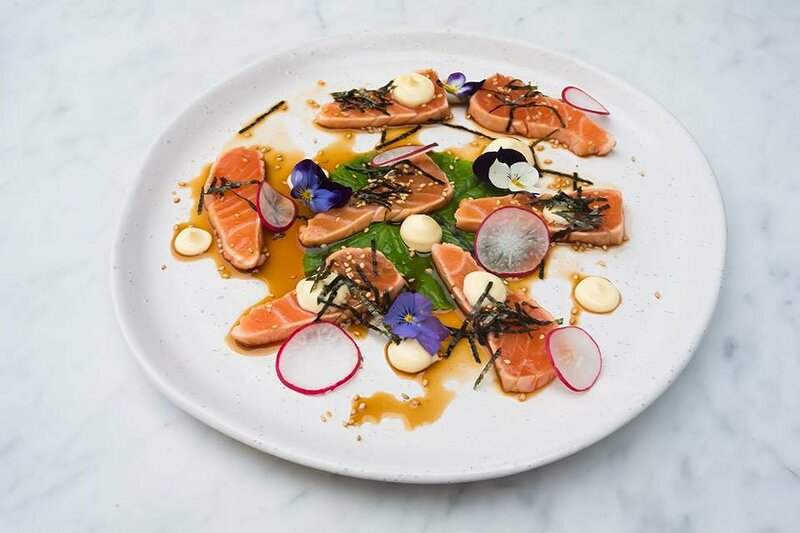 We start with a light and fresh Salmon Tataki, drizzled with kewpie mayo and a ponzu dressing that is rich with sesame bringing a touch of luxe to the silky salmon. All agreed this delectable fish was a cracking start to the evening. 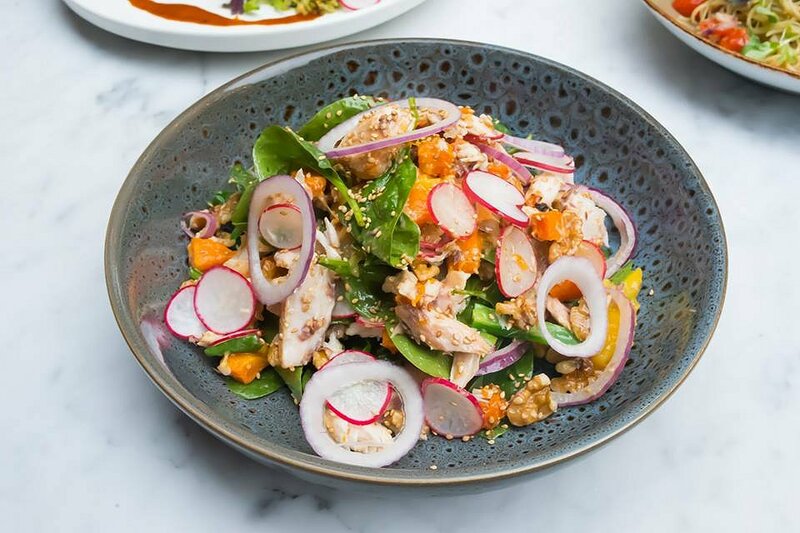 Hot Smoked Kingfish Salad presents as a Mediterranean-Asian fusion. Loads of ingredients including fresh mango, baby spinach and roasted sesame will satisfy the palate. The inclusion of walnuts for crunch is exactly what is needed and it’s bound by a citrusy orange champagne dressing. This creation will leave you feeling refreshed and healthy and like this morning’s gym session was not in vain. A rare occurrence on a pub menu! 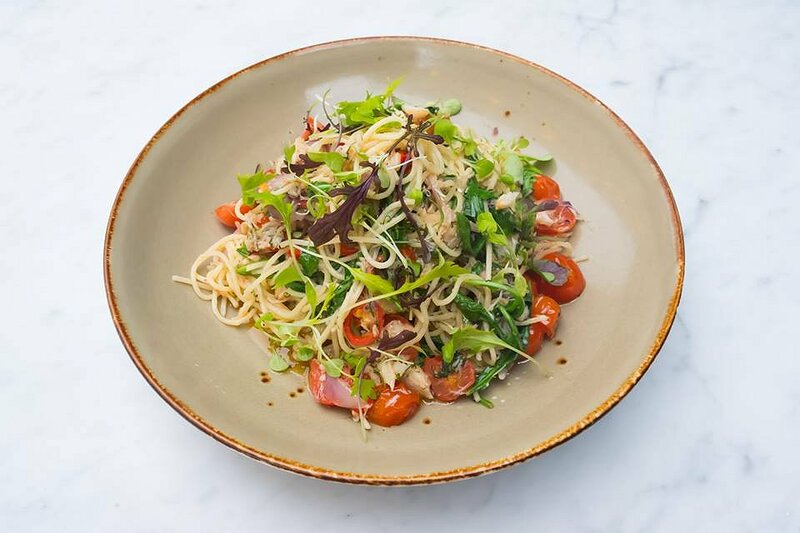 From the pasta list we indulged in the Blue Swimmer Crab Spaghettini, with rocket, dill, garlic, cherry tomato, chilli and olive oil. I loved the garlicky pasta strands that were generously covered with crab and soft roasted cherry tomatoes. The chilli provides a nice kick and the rocket brings a peppery freshness. Simple and classic ingredients that benefited from the restraint shown by the kitchen as it shines just the way it is. Equally as satisfying was the Peruvian Spiced Chicken. A spice rubbed chicken breast cooked tender and moist. 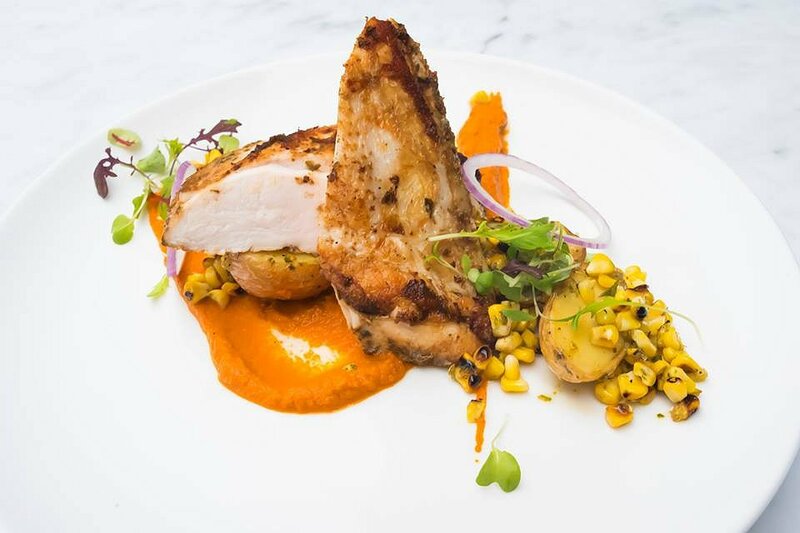 The star of the dish was the chef’s take on a Peruvian puree of confit red and yellow capsicums, coriander and jalapenos, the jalapeno giving a subtle heat that elevated the roasted chicken. A side of baby desire potato and smoky charred corn continued the South American theme. We were very impressed by the Pressed Lamb Shoulder with spiced mint gel, squash, broad beans, snow pea shoots and parsnip puree. Cubes of braised shredded lamb have been pressed and roasted, paired with a classic puree that is smooth and luscious. 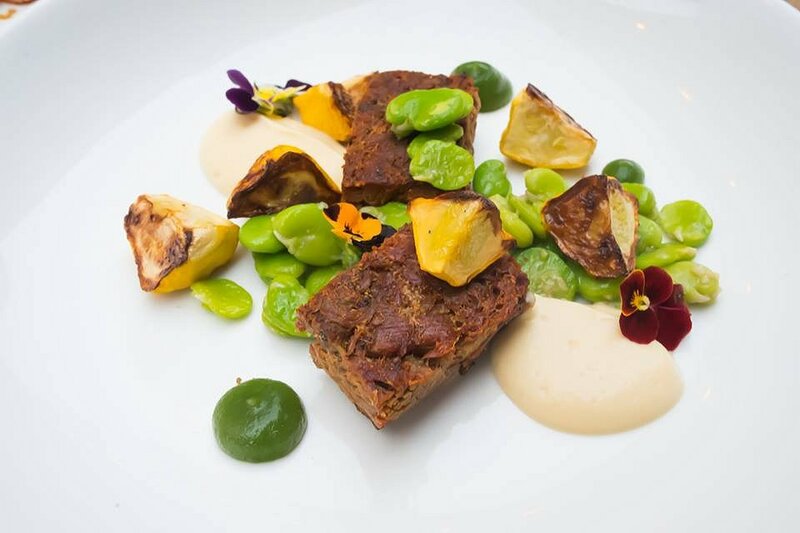 The pressed lamb is rich and tender perfectly playing off the vibrant broad beans. The hands down favourite of the night were the 48 hour Slow Cooked Beef Rib, which is incidentally the chef’s proudest dish. 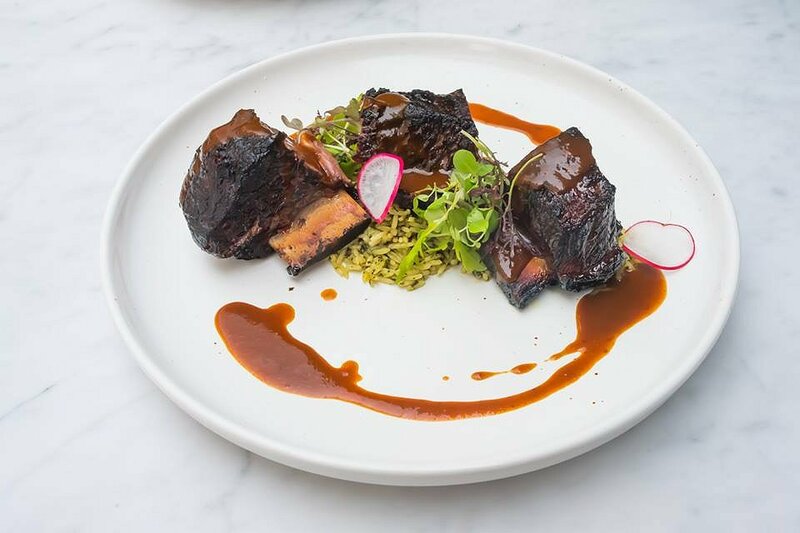 After being rubbed with spices the ribs are cooked sous vide for 48 hours at 60 degrees, which breaks down the joint tissue resulting in mouthwatering meat that just falls apart. . They are then baked and smothered in a tangy house made BBQ sauce which has a delicious smoky note. Accompanied by flavorsome South American rice and charred lime I’ll definitely be going back for more of this. Lavender and Earl Grey Crème Brulee with crunch toffee is super creamy and luscious and has a thick layer of crunchy toffee. Not overly sweet it has subtle hints of lavender and tea without being overpowering. I hate to admit that I am a schnitzel and burger girl when ordering at a pub and this culinary showcase demonstrated there is so much to choose from that is satisfying, delicious and even health! This menu most certainly has something for everyone so next long boozy lunch or night out – you know where to go!